In the last decades, the number of studies that tried to explain why some individuals get ill while others still be healthy, has increased significantly. The increase of researches in this area conducts to the identification of some variables that act as risk and protective factors for the development of mental and physical health or psychopathology (Jessor, Van Den Bos, Vanderryn, Costa, & Turbin, 1995; Rutter, 1987, 1988, 2012). Living a stressful event, the way one cope with it, and the individuals personality are some examples of this variables (Flett, Molnar, Nepos, & Hewitt, 2012; Paterson, Power, Colin, Greirson, Yellowlees, & Park, 2011; Van Eijsden-Besseling, Peeters, Reijnen, & de Bic, 2004). Lazarus and Folkman (1984) define coping as constant changes on cognitive and behavioural efforts to face a situation that the individual appraised as exceeding his/her resources. Expanding Lazarus and Folkman theory of coping, Moos (1995, 2002, 2003) proposed an explanation for coping process. He proposed that living a stressful event (Panel III) depends on one’s personal and environmental system (Panels I and II), and will influence the way he/she will appraisal and cope with his/her problems (Panel IV) and its effect on his/her health and well-being (Panel V). Moos (1995, 2002, 2003) also highlighted the interaction of all this panels at any time of the coping process. Therefore, personal and environmental system, life crisis, appraisal, coping, health, and well-being can influence each other at any time of the process. In fact, Moos (1995) theoretical postulation is very elucidative of coping process, and several studies have demonstrated it. For example, analysing the influence of coping on personality and psychopathology relationship some studies identified at least three explanation models (Aldwin & Revenson, 1987; Gomez, 1998; Gomez et al., 1999a; Gomez et al, 1999b), that are not excluding and could happen at the same time and in the same relationship (Hewitt & Flett, 1996). 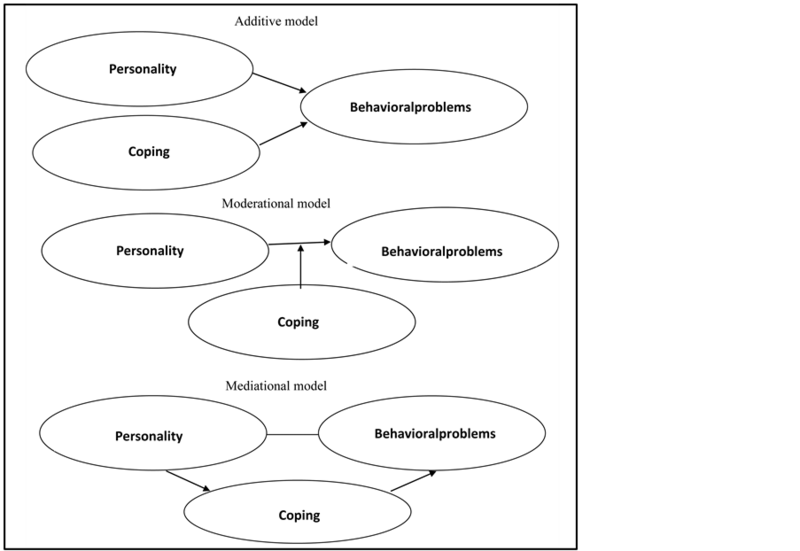 Figure 1 represent the distinct models of coping influence on personality and behavioral problems (the additive, the moderator and the mediator model) based on Gomez (1998). The diagrams on Figure 1 represent graphically the different influential models (additive, moderator and mediator) of the relationship of coping, personality and psychopathology. For the additive model personality and coping affect behavioral problems in the sense that both are implicated in the development and maintenance of behavioral problems, and the existence of both variables generates a cumulative effect on behavioral problems. Figure 1. Influential models of coping on personality and behavioral problems. statistics words, to prove the moderational model it should be found a significant relation of the interaction of coping and personality on behavioral problems (Frazier & Barron, 2004). On mediational analysis, it is explored the links among the relationship between at least three variables. The mediator variable represents the mechanism through which the predictor variable influences the criterion one (Holmbeck, 1997). That is, coping is the way personality influence behavioral problems. If so, behavioral problems would be explained by personality and by coping on a direct and indirect pathway. The aim of the present study is to investigate the applicability of the two models of the influence of coping on personality and behavioral problems (the additive and mediational one). This study will also compare the explanation models of personality, coping and health in adolescents using the theoretical and methodological studies of Baron and Kenny (1986), Rudolph, Denning and Weisz (1995) and Gomez (1998) of influential models. The prior hypotheses are: 1) anxiety trait and avoidance coping are positively correlated with behavioral problems; 2) Extraversion and approach coping are negatively correlated with behavioral problems and so can be considered protective factors; 3) The mediational model is the one that best explain the relation of personality, coping and behavioral problems; 4) It can be postulated different explanation of influential models depending on the specificity of the variables on the relationship (anxiety trait x avoidance coping x behavioral problems or extraversion trait x approach coping x behavioral problems). Participants were 558 adolescents (44.3% boys and 55.7% girls) aged between 11 to 18 years old (M = 13.92, SD = 1.45), drawn from three different secondary schools randomly selected from the metropolitan area of Barcelona (Spain). All subjects were on Secondary Obligatory Education level of Spain (E.S.O.). To measure coping responses the Coping Response Inventory―Youth form of Moos (1993) was used. The CRI-Y is a questionnaire that measure eight different types of coping strategies to a specific stressor described by the subject. These eight coping strategies are defined as Logical analysis, Positive Reappraisal, Seeking guidance and support, Problem solving, Cognitive avoidance, Acceptance-resignation, Seeking alternative rewards, and Emotional discharge and each of them comprises a six items, scored by a Likert type scale (0—not at all to 3—fairly often) and can later be grouped in the basis of its Method or Focus. The focus dimension reflects the approach (directly cope with problems) versus avoidance coping (cope with the emotion generate by the problem and not with the problem itself) dimension and is analogous to the one described by Lazarus and Folkman (1984) as problem focused coping or emotion focused coping. The problem focused coping is comparable to the approach coping and the emotion focused coping is comparable to the avoidance coping. The method dimension reflects a theoretical differentiation of cognitive versus behavioral efforts to cope with the problem. The Cronbach alpha coefficients of the original questionnaire ranged between .55 and .72 for boys and between .59 and .79 for girls, while in the Spanish version it range from .40 to .63 in the specific coping strategies and .68 and .55, for approach and avoidance coping, respectively (Forns, Amador, Kirchner, Gómez, Muro, & Martorell, 2005). To measure personality traits the High School Personality Questionnaire―HSPQ (Cattell & Cattell, 2001) was used. This is a well-known questionnaire based on Cattell’s theory (Hofer & Eber, 2002) and allows to analyze 14 bipolar scales, which characterize minor or primary personality traits that later can be grouped into four bigger dimensions, factorially obtained, called second order factor-traits (Anxiety, Extraversion, Excitability, Independence). In this study, we use the factors traits of Anxiety and Extraversion because of its equivalence with Neuroticism and Extraversion traits described on Big Five instruments (Kirchner, 2002). The purpose of this methodological choice was to facilitate the comparability between studies. Anxiety analyses psychological and physical distress, widespread fear, insecurity and sense of imminentadversity; high scores indicating tendency to experience anxiety, emotional instability, moodiness, irritability, and sadness. Extraversion analyses the sociability, and assertivity; high scores indicating high amounts of emotional expressiveness and presence of excitability, sociability, talkativeness, and assertiveness (Kirchner, 2002). The Spanish version of HSPQ has been conducted by commercial TEA specialists. It presents satisfactory psychometric properties and has large acceptability between Spanish psychologist on clinical and research field. To evaluate the adolescents’ psychological health the Youth Self Report―YSR (Achenbach, 1991) was used. Several studies have demonstrated the applicability of this instrument to measure youths’ behavioral problems in different contexts and cultures (Ivanova et al., 2007; Rescorla et al., 2007). The scale offer a total score of behavioral problems, two broad bands of problems named as Internalized and externalized behavioral problems, and eight narrow syndromic scales. The instrument presents good psychometric adaptation in the Spanish version (Abad, Forns, & Gómez, 2000). The internal consistency for Internalizing and Externalizing scales is around .85 (Abad et al., 2000), and diagnostic accuracy is moderate (AUC = .65). In this paper, the total scale was used. A school assent form was obtained from each school with the approval of Principal and Parents Associations before data collection. Students were invited to participate in the research by filling in the questionnaires individually in their own group of classmates and classroom. The questionnaires were presented to all participants following a structured order: first they were asked to answer the personality questionnaire, then the Coping Response Inventory, and later the problem-behavior questionnaire. It was assured to students that all their answers were anonymous, that their participation was voluntary and that they could withdraw of the study at any time without any penalty. It was also offered to school and students that they could receive a report with the results of the study. All procedures were carried out according to APA ethical principles. First, descriptive values (means and standard deviations) for personality, coping and behavioral problems, were calculated, and test of normality of distribution were carried out. Anxiety and extraversion trait scores were provided in Sten scores as is usually in R. B. Cattell measures. The mean of distribution is fixed at 5.5 Sten, and each one of the 10 classes comprises a half of a standard deviation width. Coping measures (Approach and Avoidance) are provided as raw score of items composing the scales (minimum = 0, maximum = 36). Behavior problems were calculated as the total raw score of 112 problems reported by adolescents, coded in a Likert scale of 0 = not true; 1 = somewhat or sometimes true, and 2 = very true or often true (minimum = 0; maximum = 224). Pearson’s correlations among personality (anxiety and extraversion trait), coping (approach and avoidance coping) and behavioral problems, were calculated to analyze the co-variability among variables. Second, Baron and Kenny (1986) method were used to conduct the mediational analysis. To demonstrate statistically, the mediating effect Baron and Kenny (1986) postulate four steps. First, the independent variable (IV) must be associated to the mediator variable (MV) and to the dependent variable (DV). Third, the mediator variable should be related to the dependent variable and four, when the mediator is controlled, there must be a statistically significant reduction in the effect of the independent variable on the dependent variable. If this reduction reaches a non-significant level a full mediation is demonstrated. However, if the relation of IV to DV is still significant but in a lower level, partial mediation is demonstrated. The direct and indirect effect of mediating process will also be calculated and discussed using the Sobel test (Preacher & Hayes, 2004). To conduct the analysis, the Med Graph calculator (http://www.victoria.ac.nz/psyc/paul-jose-files/medgraph) was used. Prior to inferential analysis the data for each scale were examined for outliers and for assumptions of normality. The Kolmogorov-Smirnov values were non-significant in all cases (Anxiety trait: Z = .677, p = .75; Extraversion trait: Z = 1.085, p = .190; Approach coping: Z = .897, p = .397; Avoidance copping: Z = .684, p = .738 and behavioral problems: Z = 1.626, p = .010. As all the distributions of data were within normal ranges raw data were used to data analysis. Table 1 . Correlations of anxiety and extraversion, approach and avoidance coping, and behavioral problems, means and standard deviations (N = 558). for boys and 50.1 for girls) according the standardized data for multicultural groups (Group 3) as indicated by Achenbach and Rescorla (2007). Anxiety trait is positive and significantly related to avoidance coping (r = .148) and in a stronger covariance level with behavioral problems (r = .449). Also, extraversion is inverse and significantly related to behavioral problems (r = −.104). No significant relation was found between approach coping and behavioral problems but avoidance coping is positive and significantly related to behavioral problems (r = .261). To test the mediational effect of coping between personality trait (Anxiety and Extraversion) and Behavioral problems, it should be accomplished the following conditions: personality trait should be related to coping, in one hand, and to behavioral problems, in another hand, and coping and behavioral problems should also be related. For the path analysis of Anxiety trait, avoidance coping and behavioral problems a significant relation was found. However for the path analysis of Extraversion trait, approach coping and behavioral problems no significant relation was found between these variables. That is, the first three steps necessary to analyze a mediational model proposed by Baron and Kenny (1987) was not reached. Because of that the direct and mediational effect will be calculated only for the Anxiety trait, avoidance coping and behavioral problems. Table 2 present data from the mediational model of Avoidance coping on Anxiety trait and behavioral problems. The analysis was conducted using the MedGrapf calculator (Jose, 2008). Steps 1 and 2 of Baron and Kenny (1986) demonstrated the additive model. Both anxiety trait and avoidance coping explain behavioral problems (with a 20.2% and 6.8% of the explained variance, respectively) with a higher level of explanation for avoidance coping on behavioral problems. That would confirm the additive model established by Gomez (1999) that both, personality and coping can increase behavioral problems. Table 2 also present the mediational data of avoidance coping on anxiety trait and behavioral problems. All four conditions specified by Baron and Kenny (1986) are defined in a level of p < .001. First, variations in levels of anxiety trait accounted for variations in avoidance coping [B = .148, F(1, 557) = 12.46]. Second, the relation between anxiety trait and behavioral problems are significant [B = .449, F(1, 557) = 140.61]. Third, variations in avoidance coping significantly accounted for variations in behavioral problems [B = .261, F(1, 557) = 10.69]. And four, controlling for avoidance coping the effect of anxiety trait on behavioral problems was not reduced. In fact, its effect increased (B = .449 for the total effect and B = .510 for the effect of anxiety trait on behavioral problems controlling for avoidance coping). These data suggest that although avoidance coping is related to anxiety trait and increase the explained variance of behavioral problems in a significant level, and although Sobel test confirms its role as a mediational variable, its’ power as a mediating variable of the relation between anxiety trait and behavioral problems is of low importance. That is, it is not a full mediation. To establish that a full mediation occurs the effect of anxiety trait on behavioral problems controlling for avoidance coping should be zero and that was not the case (B = .510). However, the Sobel test confirms the partial mediation of avoidance coping on anxiety trait and behavioral problems relationship. Table 2 . MedGraph: mediational effect of avoidance coping between Anxiety trait and Behavioral problems. personality and behavioral problems relationship by two pathways: First, the influence of avoidance coping on the relationship of anxiety trait and behavioral problems; and second, the influence of approach coping on extraversion and behavioral problems. For the first pathway, data confirmed the existence of significant levels of correlation between both avoidance coping and anxiety trait and behavioral problems. So, these data confirmed previous studies that describe that having an anxiety trait of personality and using avoidance coping increase behavioral problems in adolescence (Hewitt & Flett, 1996; Holahan, Moos, & Schaefer, 1996) and adults (Mirnics et al., 2013). Also these data confirmed the existence of an additive model of influence of personality and coping on behavioral problem (Gomez et al., 1999a; Mirnics et al., 2013). The data also established the mediational model tested so that avoidance coping can be described as the way anxiety trait influence behavioral problems as Gomez et al. (1999a) and Gomez et al. (1999b) has already described. Based on coping theory, it is possible to say that these data confirmed the influence of personality as a coping resource and that avoidance coping increase the influence of personality on behavioral problems by two ways: one, by the cumulative effect; and two by the mediational influence that it exerts on the relationship of anxiety trait and behavioral problems. Beside that, the mediational influence is of low amount, it is important to highlight the role of risk factor the avoidance coping plays. It is not only related to problem behaviors on adolescence but it also contribute to the influence (although in a small proportion) of the anxiety trait on behavioral problems. In other words, it means that adolescents who adopt an avoidance coping style are at risk for developing problem behaviors and the ones who have anxiety trait are exposed to a double risk. Heightened by the Big Five model, some coping and personality studies developed since 1990’s found significant levels of positive correlation between extraversion and positive, mature, and problem focused coping (Gomez et al., 1999b; Hewitt & Flett, 1996; McCrae & Costa, 1986; Watson & Hubbard, 1996) and significant negative levels of correlation between extraversion and avoidance coping or emotional focused coping (Holahan, Moos, & Schaefer, 1996; Zanini, Forns, & Kirchner, 2003, 2005). In this way, it can be postulate that extraversion could constitute a protective factor for the development of behavioral problems (Zanini, Forns, & Kirchner, 2003). However, data from this study do not support different models of explanation of extraversion and coping on behavioral problems, with only the additive model showing significant but low level of influence of extraversion and approach coping on behavioral problems. No influence was found for the mediational model for this pathway. This can indicate that the explaining model of personality, coping and behavioral problems can vary depending on the coping strategies involved on the equation. That is, although an explaining model can be valid for a group of coping strategies, this does not made it valid to analyze another group of coping strategies. In current study, we found an additive and mediational explanation for the anxiety trait, avoidance coping and behavioral problems pathway, while for the extraversion, approach coping and behavioral problems pathway only the additive model was confirmed. If we compare the data of this study with the theoretical proposed of Moos (1995, 2001, 2003) of coping process, it is possible to say that the personal system measured as personality variables have more influence on avoidance coping strategies than on approach coping strategies. That could indicated that approach coping strategies is more determined by environmental system instead of the personal system, while the avoidance coping strategies can be more determined by the personal system measured as personality variables. Although these hypothesis should be tested in future studies. The existence of different models of explanation on coping and behavioral problems on psychopathology depending on the coping strategies involved were described earlier by Aldwinand Revenson (1987). In their study of stress and psychopathology relationship, these authors describe the existence of a direct effect of coping on psychopathology when analyzing emotion focused coping and a moderational effect when analyzing problem focused coping. On the other hand, comparing to the literature the lower level of protective factor encountered in this study for approach coping and extraversion could have happen because we analyze coping categories such as approach or avoidance coping (as it is postulate by Moos, 1993, 2002, 2003) and not the specific behaviors adolescents relate. Costa, Sumnerfield and McCrae (1996) suggested that coping categories are functional groups and as so, it is superficial and do not describe accurately coping behavior. If so, we could not wait that the same methodology would work well for different coping behaviors. But coping, as an adaptive process, should be studied in a wide range of methodology. Previous studies demonstrate that when broad coping categories are used, these categories can lose important information about their function. This is the case, for example, for the protective role of some specific strategies such as Problem Solving grouped as Approach coping together with Logical analysis (Zanini, Forns, & Kirchner, 2003). Future studies should analyze these questions in order to made coping theory more clearly and establish some cultural differences in coping process such as the ones observed between American and Latin cultures (Zanini, Mendonça, Forns, & Kirchner, 2010). In conclusion, this study indicates that: The explaining model of personality, coping and behavioral problems can vary depending on the coping strategies involved on the equation; avoidance coping can be described as the way anxiety trait influence behavioral problems; personality can be describe as a coping resource; and avoidance coping increase the influence of personality on behavioral problems by two ways: 1) by the cumulative effect; and 2), by the mediational influence that it exerts on the relationship of anxiety trait and behavioral problems. However, more studies using different methodologies and ways to assess coping behaviors should be conduct to help understanding the risk and protective role of coping process on adolescents. Achenbach, T. M. (1991). Manual for the Youth Self-Report and 1991 Profile. Burlington, VT: University of Vermont Department of Psychiatry. Achenbach, T. M., & Rescorla, L. A. (2007). Multicultural Supplement to the Manual for the ASEBA School-Age Forms & Profiles. Burlington, VT: University of Vermont Department of Psychiatry. Costa, P. T., Somerfield, M. R., & McCrae, R. R. (1996). Personality and Coping: A Reconceptualization. In M. Zeidner, & N. S. Endler (Eds. ), Handbook of Coping: Theory, Research, Applications (pp. 44-61). New York: Wiley. Hewitt, P. L., & Flett, G. L. (1996). Personality Traits and the Coping Process. In M. Zeidner, & N. S. Endler (Eds. ), Handbook of Coping: Theory, Research, Applications (pp. 410-433). New York: Wiley. Hofer, S. M., & Eber, H. W. (2002). Second-Order Factor Structure of the Cattell Sixteen Personality Factor Questionnaire. In B. de Raad, & M. Perugini (Eds. ), Big Five Assessment (pp. 395-409). Toronto: Hogrefe and Huber Publishers. Holahan, C. J., Moos, R. H., & Schaefer, J. A. (1996). Coping, Stress, Resistance and Growth: Conceptualising Adaptative Functioning. In M. Zeidner, & N. S. Endler (Eds. ), Handbook of Coping: Theory, Research, Applications (pp. 24-43). New York: Wiley. Kirchner, T. (2002). Avaluacio de la personalitat i delsinteressosmotivacionals. Barcelona: Universitat Oberta de Catalunya. Lazarus, R. S. (1999). Stress and Emotion, a New Synthesis. London: Free Association Books. Mirnics, Z., Heincz, O., Bagdy, G., Suránvi, Z., Gonda, X., Benko, A., Molnar, E., Jaksic, N., Lazary, J., & Juhasz, G. (2013). The Relationship between the Big Five Personality Dimensions and Acute Psychopathology: Mediating and Moderating Effects of Coping Strategies. Psychiatria Danubina, 24, 379-388. Moos, R. H. (1993). Coping Response Inventory Youth Form—Professional Manual. Odessa, Florida: PAR Psychological Assessment Resources, Inc.
Rutter, M. (1988). Psychosocial Resilience and Protective Mechanisms. In J. Rolf, A. M. Masten, D. Cicchetti, K. H. Nuechterlein, & S. Weintraub (Eds. ), Risk and Protective Factors in Development of Psychopathology (pp. 179-304). Cambridge: Cambridge University Press.